Giambattista Valli AW17: What's Fashion? Giambattista Valli - and his woman - don't care about fashion. He said it backstage today, and he has said it many times before. Well, that's fashion in the sense of trends, gimmicks, and "evolving", if evolving means strong changes of signatures and far-flung leaps away from classicism. No thanks, he'd just rather make clothes that his women want to wear and feel pretty in. A radical notion. Valli never fails to present an array of impeccable looks, and this season was no exception. His is a winning formula, almost archetypical in its repeated presentation of flattering dresses and flounced femininity. The designer’s AW17 collection saw much of the same, but separates, textures, and patterns made a larger appearance than usual, shifting Valli ever so slightly out of occasionwear and into wearability. Houndstooth walked the runway first on a loosely cinched blazer and matching skirt whose flounced and layered hem, a Valli signature, repeated shortly after on a form fitting floral off-the-shoulder mini layered with a houndstooth crewneck. Similar ruffles and poufs tiered down the body on a handful of midlength dresses, first across shoulders and then along hems with small ruffled detailing gathering at necklines and along the waist. A series of striking red looks pierced the monochromatic runway, appearing intermittently as layered minis before transitioning to floor-length lace. 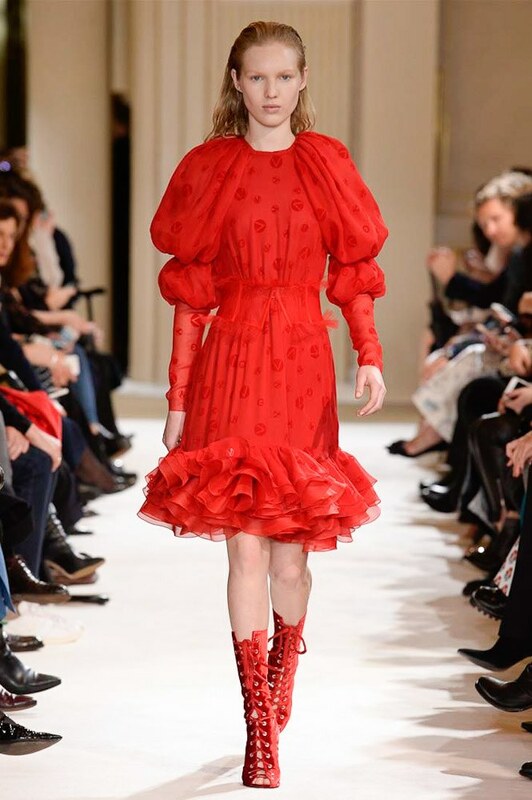 It was a familiar playfulness with volume that led to large gathered sleeves and tiered ruffled bodices, all juxtaposed with the slimming cage of a knee-high lace-up heel. Statement coats and separates interrupted the stream of lace and florals, adding volume to a generally figure-hugging collection through loosely cinched peplum waists and fur cocoon silhouettes. One coat layered strips of cheetah and striking crimson in varying widths with neutral furs, adding a linear pattern often unseen in Valli’s repertoire. The designer scattered polka dots in many forms, from the obvious red speckles patterned on model Lineisy Montero to the repeated miniature berries dotting cropped blazers and long-sleeve lace blouses. Cherry motifs, a new addition this season, appeared more sporadically, a veritable picnic along pleated tulip skirts and cream lace crewneck gowns. Even looks with Nike workout pants made an appearance. "The girl of the season? A woman who leaves the gym wearing her sports pants with a great jacket and stiletto pants to go out to her Parisian life", Valli said backstage. He knows his customer loves her Pilates. Perhaps Valli’s classicism resonates best with those who know perfectly well that they can embrace their femininity without worrying about betraying their feminism. With his mix of daywear, athleisure looks and serious date-night dresses, Valli certainly provided the wardrobe necessary to do it all.